We’ve had a pretty exciting weekend. On Friday, we posted a video of our version of the Pogues’ classic holiday tune “Fairytale of New York.” It was a fairly low-budget affair — we shot the video on a MacBook, and we relied on a pretty limited array of costumes. Even so, we were pretty happy with the results, and we weren’t the only ones. 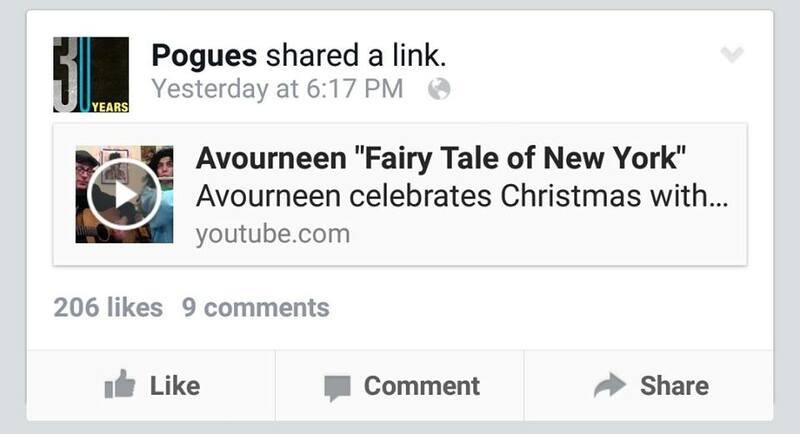 We were honored to receive a shout-out from the Pogues themselves on Facebook, complete with a link to this website and a mention of our Saturday gig at the Abbey. All three of us have been listening to the Pogues for years, and the recognition was definitely one of the high points in our short history.